Finally! I'm back. New Zealand - it is very VERY great to see you again. The past few weeks have been seriously full - coffee dates, reunions, burning holes in all my pockets, wallets and bank accounts, and not keeping up with eat it posts (sorry!). More details, recipes, photos and stories from my venture home after Korea will make their way onto the blog as I settle back in to a slightly more structured lifestyle. 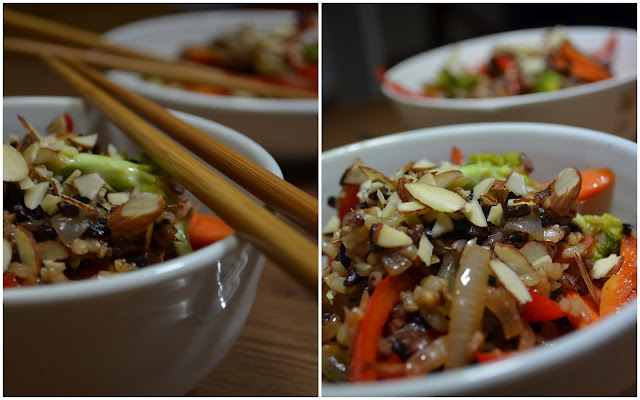 For now though, I can at last share this easy brown rice stir fry that I'd promised a few posts back. In my zucchini fettuccine post I wrote about some of my thoughts on the good and bad behind carbohydrates. Check it out here for more background info. I've become more aware in recent years that not all carbohydrate foods are right for me, namely refined grains such as white flour and white rice. So I've had to adjust some things and lower my intake of particular foods. But this does not mean I want to seriously cut out carbohydrates for good (sorry Dr. Atkins). This may seem a little out of the blue, but I want to rewind just a little - back to those angst ridden teenage years. Remember if your parents ever said "no! ", you'd want to say "yes! ", right? If rules were in place, you'd want to break them? Am I ringing any bells? Well, the same goes for me now that I'm an adult. But rather than battling with parents over house parties and riding in cars, it's food that has become the topic of debate. If I'm told I'm not allowed to eat white doughy pizza crust because it's bad for me, then I'll be breaking bars to find the stuff. The whole concept of a 'diet' or not being allowed to eat certain foods makes me feel uneasy. I have a sneaky feeling that some of you can relate to this concept and have probably experienced, at some point in your life, the yoyo effect - dieting and cutting out a certain food from your diet, feeling deprived and then compensating by introducing it back in with full force. Thankfully I now know that's not a healthy pattern! I never want to associate deprivation, hunger, not allowed and DIET with food. My solution instead is to introduce and welcome new, healthy and delicious foods! When I introduce foods that are really good for me, I notice that foods that don't bode well with my digestion or body, disappear from my menu quite easily. By consciously channeling my focus onto healthy foods that I should eat (instead of obsessing over foods that I shouldn't eat), the idea of deprivation never comes to mind. So in keeping with the theme, here is another dish that introduces a healthy whole grain, is a great carbohydrate source, fills you up and will have you dreaming of more ways to welcome it into your diet. Why Brown and Black Rice? - White rice is polished and refined so that the hul, bran and germ are removed, depleting it of its fibre and nutrients. Unlike white rice, brown and black rice only have the hul (the outer layer of the rice grain) removed, retaining it's nutritional make-up and boosting us with a bunch of natural goodness. Brown rice is extremely high in soluble fiber which is not only great for our digestive system but helps us to feel full for longer and can lower our chances of overeating. Let's not stop at fiber though. Other essential minerals in brown rice include manganese, omega 3 and 6 fatty acids, potassium, iron, and a bunch of B vitamins. Manganese for one, is needed to build strong bones, helps us to metabolise cholesterol and fats, and aides in the absorption of vitamins. Black rice takes it a step further - it packs all the brown rice punch, but its rich and deep dark colour provides super antioxidant levels. These help our bodies stay clean and neutralise toxins that creep inside us through processed foods, pollution and other chemicals. Oh, and did I mention it looks amazing. 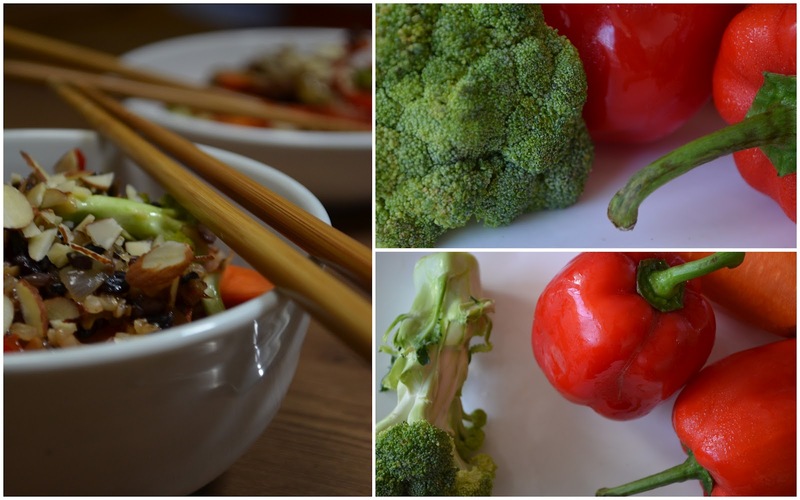 I love its deep tone and the way it contrasts against the brown rice. Black rice is a little harder to come by in supermarkets however and tends to be priced a tad higher than brown. So don't fear if you can't use it in this recipe. If you've not tried either variety before, it's good to know that the taste is different to white rice. It's nuttier, richer and, well, just more interesting! Give it a go. I've kept the flavours in this dish relatively simple to showcase the complexity in taste of the brown/black rice. The nature of most stir fry meals in my kitchen is usually very last minute and thrown together when I can't be bothered with anything too extravagant and want a quick and easy meal. For this reason I've tried to use simple flavours and ingredients that are staples in my pantry and fridge. What I love about a stir fry is that you can throw in whatever veg you've got and add a shake or sprinkle of whatever sauces or condiments take your fancy. I'm not sticking to any traditional recipe here, so please feel free to experiment with your own flavour combinations. 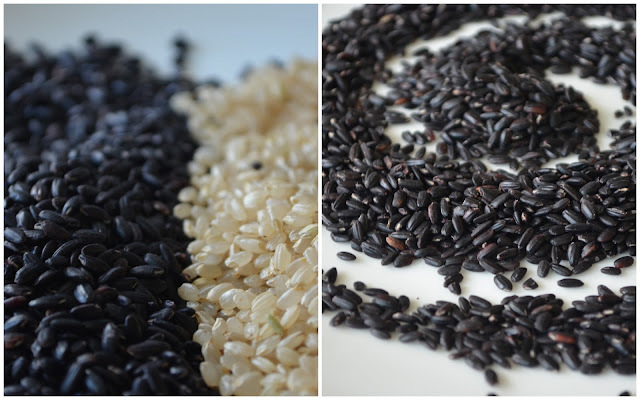 The main goal of this post is to encourage you to try out brown and/or black rice. Enjoy! Begin by preparing all vegetables and removing rice from the fridge so it is not so cold when it comes time to cook with it. Add sesame oil to a hot pan and once it glides easily across the bottom add onions and garlic. Stir and cook for a few minutes. Reduce heat a little and add the ginger and chilli. Continue to stir until the ginger is fragrant. Boost the heat and add the carrots. It's really important the pan is piping hot at this point. Toss them through the pan and add 1 Tbls of vinegar. As the carrots start to warm add the other vegetables and continue to move them so they are evenly cooked. Add another Tbls of vinegar. This will create steam for the vegetables to cook in. As soon as the pan dries out again, replace this step by adding water. Once the vegetables are heated through but still crunchy, add the rice, soy sauce and pepper. Combine everything together and keep on a medium to high heat until the rice is hot. Just before serving, mix through the almonds (leaving a little for garnish). Have a taste and add a sprinkling of salt, some more soy sauce and a dash more vinegar if you think it needs it. Serve in warm bowls with an extra topping of almonds. * I like to cook up a batch of brown rice at the start of the week and use it as I need it - usually in a stir fry and cold rice salad. I find using rice that was cooked the day before/cold brown rice works really well in this dish. But if you don't have time you can cook it whilst preparing the vegetables. Then, simply place the rice in a sieve and run a cold tap over it to cool it down a little, before bringing it back to temperature with the other flavours in the stir fry pan. There are many different methods used to cook brown rice so you can follow cooking directions on the back of the packet. I usually add it to a pot with at least three times as much water and cook with the lid ajar on a rolling boil for about 20-25 mins, drain then cool. It has a much firmer bite then white rice, so don't be afraid by this texture and overcook it! ** I like to cook the black rice in a separate pot to the brown so it doesn't stain the colour of the brown rice. Depending on the grain too, the black can sometimes take a little longer to cook. By separating them you avoid staining and uneven cooking and end up with a lovely colour contrast in your bowl. Remember too, if you don't have black rice, this dish is still great without it. *** To toast the almonds, place them in a dry pan over a low heat. Keep a close eye on them so they don't burn, and toss them every 30 seconds or so for an even toast.